36. MEDITATION and BEING -- is there an ESSENCE of CONSCIOUSNESS? • Professor Dennett and his "multiple drafts model" notwithstanding, it seems to many people that there is something more to mental life than a jumble of shifting perceptions, emotions and thoughts. The question is whether this "gut feeling" reflects something real, something fundamental, something truly essential and essentially true. Philosophers David Chalmers and Timothy Bayne have discussed the notion of a "unified phenomenal field" as the basis for conscious unity, as contrasted with an atomistic set of "experiential building blocks". According to Chalmers and Bayne, "it may be that the most basic sort of conscious state is the total phenomenal state, or the phenomenal field, or even the phenomenal world . . . these total states are basic, but they come with a complex structure from which one can differentiate many aspects." Philosopher John Searle has also presented reasons to prefer a unified conscious field theory over the building block model. • In my own opinion, there is a continuous element in waking life (and in dreaming life), a bottom line to consciousness, even when such consciousness is distorted by brain injury or intoxication. Within my own consciousness, I have at times sensed the presence of a basic "feeling of being", something that is not simply a function of what I am presently perceiving, remembering, thinking or feeling. Something beyond, or perhaps underlying the particular "quale" or set of quales (i.e., qualia) that I am currently perceiving. • I have attempted to practice meditation at various times in my life (including Zen practice), and at times have experienced unique meditative states. During meditation (in rare instances), I believe that I was able to isolate the usual concerns of life and concentrate on this "feeling of being". The fact that current neuroscientific research is correlating meditative states with specific brain and neurochemical states does not reduce them to physical principles, given that the experiential effect is so different in nature from the physical causes and effects (i.e., the same point made by Jackson in his Vision Scientist Mary and the Rose thought experiment). • The late neuroscientist and philosopher Francisco Varela said that meditative practice and the insights gained from it could significantly contribute to both cognitive science and philosophy (see Varela, Thompson and Rosch 1997. The Embodied Mind, Cambridge:MIT Press). During my personal experience with meditation, I have attempted Meditation can significantly contribute to both cognitive science and philosophy to diminish awareness of thoughts, memories, feelings, background noises, temperature, muscle and skin sensations, etc. Although it is doubtful that even the most experienced meditator can totally 'empty the mind' of sensory inputs, I have at times had a fair amount of success in achieving a state of deep inner stillness. But in those moments, I still experienced a "background radiation", something that I can only describe as a "pure feeling of being". This seemingly fundamental state of mind is variously described as "inner peace" or "higher consciousness" or "great emptiness" or the "great void" by meditators. I personally would prefer to call it "the ground state of consciousness" (perhaps "base state" or "total state" would also be appropriate). • And yet, much of the time, consciousness seems to only assume a monitoring role, and it does that choppily, as Dennett points out with "Multiple Drafts" (as does the Buddha, with his words about "the monkey mind"). There is not one unified sensory input stream; there are various streams, some being raw sensory data, others being processed and interpreted to varying degrees. Consciousness is like a TV and Tivo (recording device) having its channels changed all the time, sometimes stopping for a few seconds on a channel of interest for "further probing"; if it is important enough, the Tivo will record and save it. This process can also be pictured in terms of the chaotic brain dynamics occurring during the interactions within and between neuronal assemblies ("maps") and the greater constellations of assemblies ("re-entrant loops"), see Section 31. • I believe it to be possible that this 'ground state of consciousness' identified in transcendental meditation is an inherent component of all consciousness, something that gives it continuity; a bedrock supporting the chaotic "multiple draft" / "monkey mind" experience of daily living. This "ground state" allows us to achieve a sense of self and time, with corresponding self-history and self-narrative. It is this feeling, and not the choppy waters of our experiencing and reacting to fleeting qualia or "monkey mind" thoughts, that is the ultimate grounding of subjective experience. Physiologically, meditation allows the brain to slow down, neuron firing rates go down, and the chaotic nature of the interactions between neuron assemblies abates. • Interestingly, Dr. Giulio Tononi has said that his "Phi" measure of integrated mental information (which theoretically correlates with degree of consciousness) is very high when the mind is in a contemplative, meditative state, when neurons are not firing rapidly. Under such circumstances, the interactional chaos levels in the recursive signalling between neuron clusters are assumedly low, and the integration of background body sensations can become very extensive. Focusing on breath and basic body presence is arguably then a means to a higher or purer state of consciousness. • The opposite of a balanced mental life that is grounded in a fundamental "awareness of being" is perhaps a zombie-like sleepwalking state, or a totally chaotic and distracted existence. But the state of depression, at least in its occasional low-level manifestation, might also be seen as an eclipse of the "pure being" that is sought in meditation. Among its various "missions" and functions, consciousness is a problem solver: it has the ability to hold in the light of attention a mixture of selected sensory inputs, memories, conclusions/beliefs, concepts/abstractions and emotions, so as to seek resolution of problems. It is a way to bring many things together "on stage", to use the Baars global workspace paradigm, and then work things out so as to let the "light of being" through again. 37. CAN CONSCIOUSNESS BE FULLY EXPLAINED BY SCIENCE and PHYSICALISM ? • BACK TO THE HARD PROBLEM: The process of mental abstraction, and the directing of that abilty towards one's own body and mind (along with directing one's emotional feelings towards the concept of "me") seems to explain some of the vividness Why, for most people, is the most satisfying mental metaphor still the CARTESIAN THEATER? behind consciousness. Still, it doesn't fully answer the hard question of just what the nature of qualia is, just what is the fundamental reason for the vivid feeling inherent to conscious being. All that we've done is to bump the mystery up higher, as to allow for brain processes. Emotions may be the root of all qualia, and emotions are not all that mysterious (they are arguably "programmed responses" to environmental stimuli); but even so, the question of just what is experiencing (i.e. feeling) these emotions remains. Just why is the most satisfying metaphor for most people still the Carthesian Theater? • Most scientific and logical explanations require a "metastructure" to place an observed phenomenon into context; e.g. lightening or lightening bugs both became part of some bigger system and thus became a consequence of more basic laws and forces. This is at the heart of "reductionism". Idealist philosophers such as Hegel made the point that reality cannot meaningfully exist without the mind and its awareness (i.e. consciousness); perhaps consciousness is thus more closely tied to the metastructure of ultimate reality than the physical world of matter and energy are. Consciousness is the one Kantian "thing-in-itself" that we know. The materialist / reductionists believe that you can turn it around and make reality (as described by science) the metastructure for consciousness. But, if "reality" simultaneously requires consciousness as its metastructure, if the conscious mind is the thing that makes the "tree falling in the forest" ontologically relevant, then we appear to have a philosophical short-circuit here, something of a tautology. • Another problem with physicalist approaches is that they fail to fully appreciate the importance of synergy and dynamics. Synergy is often summarized in the phrase "the whole is more than the sum of the parts". However, within the more expansive context of "emergence", synergy means that the whole often exhibits unique characteristics relative to the individual natures of its parts. Take the simple and frequently cited example of water, H2O, which is comprised of the atomic elements hydrogen and oxygen. The nature of water is distinct and distinguishable from both hydrogen and oxygen, e.g. non-flammable water versus easily flammable gasses. Furthermore, the nature of water itself changes depending upon scale and circumstance. The sum of millions of H2O molecules in close proximity (say in a drop of water) certainly takes on different characteristics than a lone water molecule. A few trillion water molecules in a lake or a comet take on different characteristics yet. • Dynamics focus on the fact that any particular set of components can radically change its characture depending upon the internal and external movements of that set of components. A mega-liter of water molecules can exist as a calm lake, or as a smoothly flowing stream, or as a set of waves, or as a swirling vortex, or as an iceberg, or as a cloud -- depending upon relative and overall movements of water molecules, on energy levels and distributions. The particular dynamics of the whole, more than the common chemistry of the molecular parts, determines the actual effect that water will have in the world. • Synergy and dynamics together determine the "state" of the water molecules in question. Consciousness certainly reflects a "state" achieved by the myriad components of the brain. This "state" seems to influence an entity's "substance" to varying degrees (again, think of all the books regarding consciousness that the mind wants the brain and body to pick up and read). At some point of advanced complex development, shaped by and thoroughly encompasing the many Given the brain's advanced development and complex nature, its "STATE" can manifest a unique, non-reducible ontology: consciousness. physical forces and influences in the universe, this brain state manifests a unique, non-reducible ontology: consciousness. With most "emergent entities" that we study, despite their unique and unexpected behavior, the whole can still be easily broken down into its parts; when observing a V-shaped flight of geese, one can still pick out and focus on one goose. Ditto for vehicles in a traffic jam or traders in a stock market. With consciousness, it is quite difficult to pick out a "building block", i.e. a reliable "neural correlate of consciousness". And even the more promising building-block concepts such as Tononi's "phi" (discussed in Section 35) and his hyper-dimensional state-space of qualia (along with the various quantum-like and wave-like concepts of consciousness being discussed) turn out to be quite abstract. They are closer in nature to pure information than to what we touch and feel in daily life. • Just as the state of a billion water molecules will have physical effects on the environment surrounding them, the conscious state of the brain's components certainly affects the world around it (thus casting doubt on the most radical versions of epiphenomenalism). The holistic properties of a system can be causally efficacious, as research regarding emergence and self-organization increasingly shows. In this light, philosopher John Searle generally equates consciousness with unique brain states and denies epiphenomenalism. Although Searle also denies dualism, some analysts consider Searle's position to actually be dualistic. The functionalist view also appreciates the importance of "state", but seems afraid to take it to an ontological conclusion -- i.e. 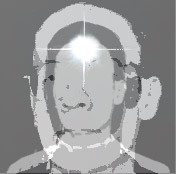 that consciousness is a unique, non-physically reducible entity. • As mentioned in Section 38, consciousness is also a matter of perspective, similar to quantum physics, where you can observe waves or particles as you wish. Dennett says something like this in discussing Multiple Drafts; and William James spoke of the "psychologist's fallacy", the tendency to observe what you have already assumed about mental process in designing an experiment. The MONIST / PHYSICALIST VIEW is not innacurate per se, but is incomplete. Perhaps we can analyze the ripples and shadows that consciousness creates out in the world, and see a machine; but ironically, that aspect of ourselves which observes this machine seems to be something else entirely. Wave / particle, Machine / mind. Both perspectives are just as real as the other. Perhaps the ontological contradictions and epistemological challenges of quantum mechanics provide a hint, if not a roadmap, as to the nature of consciousness. The monist / physicalist view is not innacurate per se, but is not complete. • Some physicists, such as the late but still controversial physicist David Bohm, felt that seemingly random quantum phenomenon were in fact caused by something -- but that "something" (i.e., "hidden variables") was inherently unobservable and unmeasureable. (Interestingly, Bohm had initially collaborated with neuroscientist Karl Pribram in developing the "holonomic brain theory".) By contrast, consciousness is the one thing in the Universe that we observe most completely, and yet it remains a thing that we can hardly measure or take apart and reduce to components and factors that are more basic and that can be shared and similarly experienced by everyone, at any time and in any place. • In some ways, this is consistent with the holonomic concept of brain functioning proposed by Pribram and Bohm, which emphasized the holographic nature of mental phenomenon, possibly reflective of an "implicate order" to the universe where the hidden variables of quantum dynamics were enfolded. Science and physicalism can and is telling us a lot about consciousness. Given the inherent "spread-out" and scattered functioning of a holographic process, consciousness could thus be seen as holistic and indivisible in nature. But despite such "hints", consciousness for now remains somewhere just beyond the ultimate boundaries of the modern scientific method. 38. QUANTUM PHYSICS and CONSCIOUSNESS? • What the Bleep? Similarities to Quantum Physics: Dr. Daniel Dennett, the great materialist / reductionist, says in his "Multiple Drafts" theory that the manner in which consciousness is probed determines what is finally observed. I could not help but think of the similarities The manner in which consciousness is probed determines what is finally observed with quantum theory; specifically the idea that on the subatomic level, where you can only probe particles by using other similar particles, the act of measurement affects the reality being measured. Thus, it is not surprising that the act of probing consciousness with consciousness itself is an inherently uncertain process, as with quantum-level measurement under the Heisenberg Uncertainty Principle. I'm not suggesting that quantum theory be expounded as the key to all mystery, as the movie "What the Bleep Do We Know" quite spuriously did. • Also, I am not entirely impressed with Penrose's theory of quantum coherence as the source of consciousness. This theory could account for many problematic characteristics of consciousness, such as the binding of various sense data into a unified experience, and the transition from sub-conscious to conscious states. However, it is subject to various objections, basically questioning whether quantum-level events can effect the operation of a neuron, or do they instead drown each other out (like white noise) because of the relatively large size of a neuron compared to a quantum particle, and the high level of constant interaction and signal looping within a vast neighborhood of other neurons. • Computer Scientist Scott Aaronson also uses quantum physics to conceptually understand consciousness. He says that an inherent feature of consciousness is that it "participates fully in the arrow of time", because "it has to produce irreversible decoherence as an intrinsic part of its operation." I.e., the process of consciousness is sensitive to tiny quantum fluctuations at one or more points within the brain. Quantum physics has an anti-copying rule (consistent with the Heisenberg Uncertainty Principle) stating that physical process cannot produce an exact copy (guaranteed to any level of precision that you select) of a quantum particle matching all of its characteristics (position, momentum, spin, etc.). • Various researchers have studied a variety of ways that quantum events could influence neural processes, e.g. through chaotic processes within certain molecular structures, or via instantaneous orchestration of distant events through quantum entanglement. On the other hand, Recursion is important for integration and stability, and may wash out quantum effects from the sub-atomic level most neuroscientific research on the "neural correlates of consciousness" indicate that conscious brain states are closely tied to recursive (looping) processes (i.e. situations with feedback, where signals go round and round). E.g., the "map loops" discussed in Section 24 and 31 . Recursion is important to both data integration and output stability, allowing a steady "picture" of a complex environment (external, i.e. sensory inputs, or internal, i.e. imagination or other mental imagery) to be outputted for decision making and behavioral purposes. However, recursion can wash out tiny quantum fluctuations on the atomic and sub-atomic level; one particular jiggle in an electron will not significantly change the state of a looping feedback circuit. • Regarding the interaction of quantum inputs with a recurrent semi-chaotic, middle-scale mechanism (on the level of multiple molecules), the patterns that result in the system CAN in fact be influenced by the nature of the quantum particles that make up the system; but not by any one particular quantum jiggle. I.e., the underlying "wave function" or event probability functions of the constituant particles help to determine what the "strange attractor" output pattern of the big system looks like. • So, quantum physics can be a valuable input into understanding a complex, chaotic looping system like the human mind. But still, theories such as Penrose's and Aaronson's, which depend on individual quantum events, may not turn out to define the "bedrock level" of consciousness, the "sine qua non". And even if true, these theories seem to push the ultimate ontological questions regarding consciousness off to another level, without answering them or considering their implications. The nature of qualia and experience remain unaddressed by Penrose. • Overall, the notions of quantum mechanics must be used reservedly outside of the micro world. However, with regard to what we can or cannot know (i.e., epistemology), there perhaps is an appropriate comparison between consciousness and quantum physics. With regard to quantum particles, we can see evidence of the particle in a vapor chamber or on a piece of film, but nature just doesn't allow us to perceive Quantum mechanics must be used reservedly outside of the micro world "the thing itself". At lengths and times smaller than Planck's limits, we cannot know what is happening. Likewise, we can analyze the ripples and shadows that other peoples' consciousness create out in the world, but ultimately we cannot directly experience (and thus precisely observe) any consciousness other than our own. Consciousness, like an electron or photon or quark, is ultimately a "quanta", something that cannot be cut into smaller pieces or parsed into components. 39. IS CONSCIOUSNESS THE CAUSE OF ANYTHING -- DOES IT AFFECT BEHAVIOR? • Interestingly, this "unfolding challenge" type of situation includes intellectual consternation over abstract topics, such as 'what is consciousness' (or what is love, what is freedom, what is a quark, etc.). These situations may occur less than 5% of the time in any one life. Thus, consciousness doesn't seem to influence behavior very often; it may well be mostly epiphenomenal in that sense. But in the rarer, more complex "slow crisis" situations more typically studied by traditional psychologists, consciousness appears to reflect a process influencing behavior. But is the "hard problem" aspect of consciousness, i.e. the "pure experience" aspect which cannot be broken down entirely into sub-conscious computing processes, truly involved with this? Or is it really just watching from the sidelines as an epiphenomenon (as the property-dualists contend)? This is a much more difficult question. • If dualism is accepted but "hard-problem consciousness" is shuffled off to the end of an acausal one-way street (e.g., the "token epiphenomenalism" accepted by various philosophers including Frank Jackson and David Chalmers), then why does the "easy-problem" aspect of consciousness, It APPEARS that consciousness HAS had an effect on the physical world; think of all the books that have been written on the topic! i.e. the machine-like information processing of mind and brain, cause many of us to be so concerned with the overall question of consciousness, to put so much energy into that question? Since the 'easy' form of consciousness is mechanistic, while the "hard question" form is epiphenomenal and thus cannot "talk back" to the mechanistic realm under the strict "token" version of epiphenomenalism, one wonders how the "mystery of consciousness" issue could even arise. • In a way, this is reminiscent of the paradox that Leibniz pointed out in his "brain as a mill" argument -- i.e., even if you could see and understand all the workings of the brain as you could the workings of a life-sized mill, how could you know that the mill was in an "in love" state or in a "sadness" state, given that the results of these states took place outside the mill and could not be communicated back to the mill? An information transfer from the epiphenomenal realm is not allowed (under the strict "token" interpretation), given that it would have an effect on the physical world . . . even if that world has the "property" of (epiphenomenal) consciousness within it. • Unless we are living in a Boltzmann Brain, where the physical world exists in a minimally organized state of darkness and void, and where most of what a conscious being would perceive is an illusion caused by cosmic accident, then it at least appears that ethereal consciousness HAS had an effect on the physical world. Think of all the books that have been written and all the class discussions held on the topic of consciousness! A more interesting possibility, to me, is that we do in fact exist in an overall reality that is somewhat akin to a mind-dependant Berkeleyan idea, but an interactive and emerging "idea" that is driven by a complex and living world of information . . . and that this "information-reality" somehow has pre-knowledge of a differing realm or ontological dimension, where conscious experience takes place. More on that in Section 42. • There has been much more energy expended on the subject of consciousness than on a clearly fanciful creation such as unicorns. It would seem awfully strange if our conscious perception exists in an epiphenomenal and non-causal realm, and watches as our material brain and body act and react "as if" they knew about the feelings that their actions might cause in the conscious realm. Stranger still that this "material" brain, body and universe were really more like a Berkeley idea-world, one driven by something akin to a huge etherial computer. And yet, the question arises as to whether this is any stranger than what science Is this any stranger than what science tells us about the quantum world? tells us about the quantum realities that underlie our seemingly mundane everyday life, or what cosmology tells us about the supposed origins of the observable universe? Or any stranger than what Dr. Dennett and the many other physicalist / non-dualists propose regarding consciousness, i.e. that neurons and their systemic discharge patterns can entirely explain what it means to be in love or to behold a perfect red rose or be moved by a song? Can true poetry be entirely reduced to Phi and qualia state-space patterns? • We can imagine and to some degree even observe the differences between a human acting with purpose and intent while in a non-conscious "zombie-like" state, and how a person acts while fully conscious. I.e., we can observe the behavioral differences between those who are sleepwalking, suffering an absence automatism, or otherwise in a high-level vegetative state, versus those in a normal waking conscious state. The former can carry out intentional behavior, sometimes quite complex behavior; but they generally do not speak or otherwise attempt to communicate with others, nor do they appear to experience a state of feeling as expressed through singing, crying, laughing, speaking in an angry or fearful tone, etc. Consciousness (the hard-problem kind of consciousness, the etherial, subjective sense of the term "consciousness") appears to cause emotive changes in behavior, or at least to correspond exclusively with something that does cause such expressive behavior. What is behind that appearance? • I believe that HUMAN CONSCIOUSNESS has much to do with the human minds' ability to abstract; but not in the way that Descartes explained it. Abstraction is a key feature that separates us from other species -- and thus far, from machines and computers. It enabled us to form a self-reflective concept, a way to reflect and refocus 'raw consciousness' (akin to Damasio's proto-self and core consciousness) in on itself. • Through evolutionary processes, the ability to formulate concepts and abstractions through inductive logical mechanisms was selected for its survival value, as it helped those possessing it to understand and manipulate the environment. At some point, the growing ability of the human species to formulate concepts like weight, density, hardness, coldness, smoothness, etc. was turned inward, causing the human being to formulate the concept of "me, myself, I". • As to ANIMAL CONSCIOUSNESS: I don't believe that most animals are conscious, although certain higher-level mammals probably do experience an abstracted version of what human beings experience as consciousness. In my opinion, insects, most reptiles, and lower mammals are closer in nature to robots. Consciousness has much to do with the human mind's capacity for abstract thought; but not in the way that Descartes explained it. Perhaps dolphins and chimps experience "qualia" and vivid awareness of emotional states. But the lower animals generally seem generally insentient save perhaps for the raw emotion-like behavioral responses akin to anger, fear, and joy at finding food. See also Section 18. •	The "high" version of consciousness that humans know evolved in our species through three factors: 1.) the development of sophisticated inter-personal communications abilities, i.e. language; both in terms of word formation (semantics) and rules for stringing words together to tell a story (syntax); 2.) an abstract internal concept of self (i.e. self-awareness), an awareness of a self-being that is seperate physically and fundamentally from the environment surrounding that self; and 3.) an autobiographical memory (e.g., 'I was born a few bends down the river, and my father was the warrior leader of our group'). They helped humans to attain a brain-mind system that would step beyond the horizon of consciousness, through: 1.) the cross-integration of information; 2.) the increased distance of environmental awareness beyond the immediate body; 3.) a continual monitoring and interaction with the environment, appropriate to the temporal dynamics of that environment; 4.) a vast comprehensiveness of environmental awareness, ranging from grains of sand to the sun, moon, stars and galaxies (and later from quarks to the Big Bang); and 5.) a "time-echo" caused by the short-term memory faculties and the looping process, which together give the "unified consciousness picture" an unfolding continuity that avoids William James' "great blooming, buzzing confusion". To what degree, and through what mechanisms, can animals or machines achieve this kind of consciousness? •	Certain higher primates and dolphins, probably whales also, appear to use rudimentary language. Arguably, there is some abstracting, some "higher order thought" going on in their heads. They are also quite social. It could be that the notion of "me" versus "all the rest of you" occurs to these creatures (consider that chimps recognize themselves in a mirror; dogs and cats do not). It's not impossible that they could pass the above "high consciousness" test (although any autobiographical memory would be very weak). • As to machines . . . most introductory texts on consciousness discuss the "Turing Test", a method that was proposed by computer scientist Alan Turing in 1950 to determine if an expressive computer device has obtained human-like mental abilities. The Turing Test is fairly simple: it says that if a communicative computer could fool enough people into thinking they were interacting with a fellow human, it then has human-like intelligence. • Turning was arguably concerned with the more limited question of intelligence and mental capacity, and was not specifically concerned with whether machines actually possessed human consciousness. Today, super-computers can operate programs that arguably can pass the Turing Test. • A machine with human-like mental abilities which can express itself using human language is just a first step, though. It does not clearly signal that the machine has become self-aware of emotions, i.e. that it shares something akin to sentience and self-consciousness. I propose that for true consciousness to emerge, it would be crucial to create a machine that has comprehensive human-like functionality and existence challenges, and is not just an intelligent means to project convincing sound waves and images on a digital screen or onto a plastic face. • For the most part, human-made machines are "hot-house flowers" that depend on humans to build them and provide them with energy and suitable operating conditions Machines and computers are hot-house flowers that depend upon humans for survival and reproduction (akin to food and shelter). If they are successful, humans will replicate them; they cannot reproduce themselves. To the degree that they need improvement, humans will do that; they are not subject to a natural selection process mediated through a hostile environment. Machines do not struggle to stay alive and reproduce, as humans (and other arguably conscious beings) do. • If independent and self-reproductive machines are ever created and set loose in a challenging environment that can nonetheless sustain most of them (with some casualties, as in human life), then a real consciousness might eventually self-organize and emerge within these machines, akin to how we and a few other biological species gained consciousness. Of course, this may not be desireable, unless these machines were put in an independent environment in which humans had no interest (say on the planet Mercury). • One interesting possibility, though, would be a sophisticated digital emulation (simulation) of complex "virtual actors" with human-like intelligence (enough to satisfy Turing), along with human-like social tendencies, set loose within a rich and challenging digital environment. I.e., we would program an extremely complex simulation program akin to the "Matrix", to see if conscious-like behavior emerges within the "virtual beings" residing in it. Such a gambit would be an "in silico" version of something philosophers have discussed from their armchairs for many years, i.e. "the brain in the vat". • If we could simulate say 100,000 years of existence for millions or even billions of such virtual creatures, the question arises as to whether they would start building nations and passing laws and writing books and developing smartphones and painting masterpieces and committing murders and singing songs and regretting death and creating religious institutions and having messy personal lives while doing other silly things in the name of love? Would we watch them living passionate lives involving both joy and tragedy, dreams and hopes? Would we "real humans" feel kind of funny when it was time to pull the plug and end the simulation? • There is a school of thought regarding mind and consciousness called "functionalism", which holds that mental states, including consciousness, are ultimately about what they do and about the "software" that causes them to do it, versus what they are made of (i.e., the "hardware"); thus, a dynamic mental state does not necessarily require an organic, carbon-based form of life such as the homo sapiens species to host it. This line of thinking has been promoted publicly by computer scientist Douglas Hoftstadter and others. • But in the end, an "in silico" consciousness would be a form of consciousness derived almost entirely from human consciousness. The digital actors and their virtual environment would be based mainly on what we know about ourselves and our own environments. We would only recognize their consciousness because of the similarity of their own behaviors and reactions to ours, even if we did not "hard wire" those behaviors and reactions into them, i.e. they legitimately evolved and independently emerged over time. Despite the emergent process involved, their conscious Matrix-like being would be mostly a gift or inheritance from humankind (just as dog consciousness was largely developed and shaped by humans over approximately 15 to 20,000 years, see Section 18). • If the Turing Test is interpreted as saying that "we can recognize in others what we know about intelligence and consciousness because of our own experience of it", then perhaps the flip side of Turing implies that a truly unique form of intelligence and consciousness may not be recognizable by humans! We could stumble across an intelligent and sentient being or force, and never know that it was thinking and feeling!! (And they might not recognize our consciousness either.) We might not recognize this entity's means of communicating (and ditto for what they might make of ours). Some people wonder if that is at least partly behind the failure of the Search for Extra Terrestial Intelligence project to detect any sort of intelligent life signals from the heavens. 41. THE GOD QUESTION: EASY OR HARD PROBLEM? •	Yale Psychology Professor Paul Bloom cites infant development research indicating that a baby's understanding of physical forces in the world develops seperately from its understanding of human relationships, so as to argue that we are natural born dualists. Various studies show that babies start to understand basic physical concepts like solidness and gravity and persistence (i.e., that stuff doesn't just disappear) at a different time than when they pick up on emotions and facial expressions and other social capabilities. These phenomenon are mostly a matter of genetics (although as with everything genetic, they also need the right environment to manifest themselves). These effects also appear to stem from separate brain components, having evolved at different times and under different circumstances. Thus, according to Bloom, they make it easy for the brain / mind to conclude that the body belongs to one world (the physical system), and the self belongs to an ontologically different system (i.e., the social system). According to this view, Chalmer's hard problem / easy problem dichotomy is just a side-effect of evolutionary history. Thus, the mental world is ultimately an "easy" problem. •	But Bloom doesn't stop there. He says that this evolutionary dichotomy, along with our evolutionary ability to abstract and come up with explanatory concepts, is responsible for our belief in God. Our brain's ability to hypothesize the causes behind things seems to go into overdrive when we think about ourselves. We can see purpose, intention and design even when they are not really there. We are hypersensitive to signs of intentionality (that's why conspiracy theories will always be welcome). We believe that everything has a reason. And God becomes the reason, and our self-awareness becomes an eternal soul seeking its salvation from that God. •	So, according to Bloom, we first see ourselves as having an independent consciousness, with a nature different from that of our bodies and everything else around us. This independent consciousness is related to the "hard problem" version of consciousness, and it should really be called "the soul". The idea of God satisfies the itch for an expanation of everything - wrongly, Bloom implies. We then keep right on going, projecting that if we can have a soul apart from the physical world, there must be a master soul out there somewhere -- i.e., God. This God also answers the frustrating question of "what caused it all". Our conspiracy-theory prone minds want an explanation for everything, but we come to a grand halt when we ask 'where did it all came from'. The idea of God finally satisfies the itch -- wrongly, Bloom implies. •	SIDENOTE: Bloom certainly isn't the only voice from the realms of brain science decrying humankind's propensity to believe in God. Recall geneticist Dean Hamer's "God Gene" theory, regarding correlation between the VMAT2 gene and a person's sense of self-transcendence. And of course, there are the recent works of Daniel Dennett, Richard Dawkins and Samuel Harris which espouse the benefits of godlessness versus the evil and backwardness of religion -- "the New Atheism", as it is called. •	And yet some scholars postulate that consciousness is an intrinsic although subtle sign of a universe with an intelligent, transcendent creator. A dualistic ontology of consciousness, if it could be vindicated, would not prove the existence of God. But it would not If there is a hard problem of con- sciousness, then the even harder question of God remains in play. if it could be vindicated, would not prove the existence of God. But it would not preclude such a possibility, whereas most physicalist / reductionist interpretations would make this seem unlikely. Perhaps we need a "gap" for there to be a "God"; if everything could be explained to everyone's satisfaction by unsentient forces, the idea of God would clearly violate Occam's razor. If there is a hard problem of consciousness, then the even harder question of God remains in play. However, Fr. Pierre Gassendi, a 17th Century priest and astronomer, seemed able to embrace Epicurian skepticism, empiricism, atomism and materialism, and yet still find room for God as creator and savior. Also, in more recent times, Dr. Nancey Murphy defends a version of materialism consistent with belief in a Judeo-Christian God. • Given the aforementioned problems with "radical physicalism" and strict (i.e. "token") epiphenomenalism, I will next engage in a metaphysical interpretation of consciousness using something akin to a classic substance dualism approach, but more accurately, a dualist interactional approach assuming a virtual, information-centered reality behind the consciously-observed universe. Dualism is generally an unpopular view within academia. It is certainly less "economical" than physicalism, as it requires speculative assumptions; not only about the nature of the brain, mind, and the phenomenon of consciousness, but about the ontology of the entire universe. However, it will provide a better fit with the actual experience of conscious awareness as reported by most people. It doesn't need to expend great energies defending the difficult notion that our inherent understanding of experience and self is delusional, mere "folk psychology" akin to witches and ghosts. It doesn't need to challenge the one thing that we all truly know as a "thing in itself", something more real to us than F = M x A or E = M x C² can ever be, no matter how much empirical evidence is presented to support those propositions. • I would envision a dualism based around a "big picture" regarding the nature of the entire universe, a big picture inspired by and largely revealed by modern science. In the 18th and 19th Centuries, a scientific view of I envision a dualism based around the "big picture", the nature of the entire cosmos as revealed by science the world emerged that challenged the major religious cosmologies and ancient philosophies regarding our universe, but ultimately did not contradict humankind's everyday intuitions about reality. Thanks to Isaac Newton and other pioneering mathematicians and early scientists, we could imagine a realm that was comprised of a vast ultimate emptiness, populated by a myriad of tiny little balls or particles. Those particles in their various aggregations and interactions made up all of the stuff that we knew. • These "tiniest components" were entirely real and impregnable, having unchanging fundamental characteristics. They interacted with each other according to fixed laws and forces that were ultimately knowable in full. These particles were seen to aggregate according to the known forces in various (and ultimately predictable) ways, so as to form stars, planets, gasses, liquids, solids . . . everything that can be known. They occupy and move across a stage of space and time, the latter two entities themselves having unchangeable characteristics. I.e., an inch was always an inch no matter what the circumstances; a minute was a minute for every possible observer. A straight line was always straight, no matter how or where you looked at it. According to Laplace, all of reality -- past, present and future -- was ultimately predictable; i.e., with enough information, everything about the future could be completely predicted . . . or so it seemed back then. • It was easy then to believe in a "hard, real world", a true materialist reality. Defenders of traditional Western and Middle Eastern religious views tried to carve out and defend certain realms within this universe that were allegedly beyond the grasp of mechanical realism. Their two most important lines of defense focused upon an alleged mysterious force (i.e., "vitalism") within all living things, a force that distinguished bacteria, trees, fish, cows, etc. from all the other 'dead matter' in the universe; and upon an other-worldly soul driving our human personas, responsible for the confounding nature of conscious experience. • But the power and expansive progress of the materialist/physicalist tradition could not be checked. The first of the Godly "great walls", i.e. the notion of a divine life-force infusing all living things, soon fell to organic chemistry and biological advances, and the coffin was nailed shut after the unveiling of the information code (RNA and DNA) lurking within the chemistry of every living cell. The second line of battle, the insistence upon an other-worldly immaterial soul co-habitating our human bodies and brains, also became increasingly untenable to the thinking class. The last bastion of "soul defense" appears to be "near-death experiences". The results of a recent rigourous study of reported near-death experiences showed most cases to be explainable, but identifed a tiny number of instances where questions remained. This study is alternately cited as supportive and dismissive of the possibility of conscious experience transcending the substantial incapacitation of the cortex. • The realm of consciousness thus seemed utterly exposed to physicalist elucidation; it was very reasonable to believe that it was (and still is) just a matter of time until consciousness is reduced to known scientific elements and shown to be just another interesting combination of material phenomenon, The realm of consciousness seemed utterly exposed to physicalist elucidation just as lightening, earthquakes, shooting stars, and even the cycle of growth, death and reproduction within the biological sphere had previously been brought to bear. The "discovery" of the Big-Bang origin of the observable universe in the second half of the 20th Century seemed to restore some room for mystery, but in recent years cosmologists have made great progress in putting the origins of our universe into the context of mega-phenomenonal concepts such as "eternal inflation" and the multiverse. • And yet, as the final defenses of the holy men were overrun by science in the 19th and 20th Centuries, science itself found (but has been slow to admit) that its own foundations and philosophical groundings were being eroded, ironically by its own progress. In the first few decades of the 20th Century, the work of Albert Einstein showed that the on the most expansive levels, the universe was not comprised of a fixed time and space grid, one that could be referenced by any possible observer. Time and space themselves were seen to be changing and contingent; observers who experienced an acceleration of motion or a gravitational force that was different from what another viewer experienced would disagree with that viewer's perception of straight lines and her or his measurements of time and distance. • In this "new world" of relativity, one constant was still available for the grounding of theories and for empirical predictability, i.e. the speed of light. But at the same time, questions arose as to just what light was. The study of light and electromagnetism eventually led to the discovery of quantum mechanics by the late 1920s. It became increasingly clear that light would not fit in with the concept of a reality made up of fixed and hard "ultimate mosaic tiles" of reality. Light turned out to be particulate, but not in the usual fashion; the particles of light were themselves contingent and wavelike, possessing inherent uncertainties and fuzziness (versus the fixed particles that theoretically could be completely known in any circumstance of time and space). In some experiments, light particles could be interpreted to exist in two places at once. Worse still, it turned out that all of what we thought of as hard matter was itself comprised of the same kind of fuzz-ball particles. • Even though most scientists soldiered on and made great advances throughout the 20th Century, protected in the notion of a world of known and knowable relationships and predictable mechanical interactions between aggregations of point particles, it was slowly becoming clear that this was just a useful delusion. It amounted to a "middle level" heuristic (rule of thumb), one that fell apart when you looked to the broadest expanses or to the tiniest components of our universe. As the late 20th Century turned into the early 21st Century, and extensive evidence was gathered and deeper thinking done about the cosmos and the quanta, increasingly sophisticated theories regarding the ultimate forces and laws emerged. • Several modern theories seek to find an ultimate consistency between what we know of the relativistic world described by Einstein, and the sub-atomic quantum realm identified by quantum mechanics and later refined into the Standard Particle Model. Some of these better known paradigms include superstring theory and inflationary cosmology. One of the lesser known but similarly important theoretical views is called "loop quantum gravity". Another mathematical paradigm asserts that our 4 dimension (3 space plus 1 time) universe could be a "holographic projection" from a 3 dimensional "reality manifold", i.e. perhaps a 2 dimensional "wall" moving through time (which is then the 3rd dimension). This concept was inspired by what our scientists have learned about black holes. • The holographic principle is especially important to the realization that there is a reality behind the world that is VERY DIFFERENT in nature from the way that we perceive it. Dr. Sean Carroll, a well accomplished modern cosmologist, gives a good overview of the holographic principle in his book "From Eternity to Here". He then tells us why it is so important: "It means that spacetime is not fundamental . . . holography says that . . . there are subtle correlations between things that happen at different locations". I.e., our world is "non-local"; another startling example of "non-locality" in modern physics is the phenomenon of "quantum entanglement". If universal holography is correct (it is not yet accepted as a proven fact although evidence is mounting), then there is a wholely different reality behind our universe. That reality would not be confined by spacial separation and the speed of light. Perhaps not even by time -- both space and time might be "emergent phenomenon". But if so, then from what would they "emerge", and into what would they manifest themselves? • What some theoretical physicists and cosmologists seem to be finding (or at least seeing hints of) is that ultimately, the only sure thing in the universe is the math!! And math is ultimately just information. Ultimately the only sure thing in the universe is the math! The reality behind whatever these sophisticated mathematical paradigms are driving increasingly eludes our best evolving theories. According to the work of certain computer scientists such as Edward Fredkin and Seth Lloyd, the universe looks more like a computer in and of itself -- given that the true essence of such a computer is information, and not the "physical" structure holding and processing that information (as with your personal computer or tablet or smartphone). Just as light was shown in the 1920's by Michelson and Morley to be a wave not requiring a "hard" physical medium, the computational universe itself may ultimately amount to information not necessarily requiring a referential or supportive physical stratum. • Thus, it is becoming increasingly fashionable for theoretical physicists and cosmologists to ponder the notion that, in some sense, the "real world" is ultimately closer to a computer-driven illusion or a “virtual reality” than to a world of real particles interacting in a realm of real time and space. In the 1980's, John Wheeler hinted at this trend in his famous "it from bit" motto. • A small group of physicists have expounded the concept of a digital physics and computational cosmos for several decades now, and in recent times, some respected physicists and philosophers have pondered the notion that our world is ultimately some sort of programmed simulation, possibly driven by a computing system devised by a civilization of superior intelligent beings. Of course, the problem then arises as to whether those beings themselves aren't just some simulation in a higher-still setting, on and on -- philosopher Nick Bostrom ponders that we might be part of an unfathomably large series of such nested simulations! Nonetheless, the common denominator of all of these concepts is INFORMATION. At bottom, information may be the sole and ultimate reality that is discoverable by science. • For example, cosmologist Max Tegmark has discussed the notion that the fundamental reality of the universe is actually the abstract mathematics behind the ultimate laws governing the universe. (Recall that physical theories and laws, in and of themselves, are no more than information.) Interestingly, Tegmark has also endorsed Tononi's Integrated Information Theory / Phi concept while putting forth his own consciousness theory, i.e. that consciousness involves a specific physical and informational state which Tegmark calls "perceptronium". • Another idea regarding the overall universe, from physicist Mark Van Raamsdonk, is that quantum entanglement may be responsible for a holographic process that is grounded in information from a 2-dimensional surface. From the hypothetical "outside" of this entangled system (there would not really be anything existing outside of it), The common denominator of these concepts is INFORMATION . . . the information "tail" has become the dog, and the original "real universe" dog has disappeared the system itself -- i.e., the universe -- would appear to be unchanging. There would not be any time, nor any motion through space; nothing would be changing, everything would be still -- just information on a surface of some sort. From the inside, when you are entangled (in the sense of quantum particle entanglement, where the instantaneous linking of behavior between multiple particles appears to violate the light speed limit) within the system and interacting within it, the hologram of space, time, particles and motion emerges, and you experience a world of things moving, and of space and time for them to move in. • In a way, then, the information "tail" has become the dog, and the original "real universe" dog has disappeared (or is fading away, anyway). • Thus far, these speculations have not been based on any hard empirical evidence (although scientists are proposing various experiments to test just how unshakably "real" the substances that we believe to make up our universe truly are, i.e. time, space, matter and energy; some of these experiments would search for tiny flaws in the operation of the "master virtual reality" program). These speculations also vary quite a bit depending up on the imagination of the individual physicist. But given that the ultimate nature of reality is now being reconsidered by our cutting-edge cosmological and micro-physical theorists, and given that the quantum-like indeterminacy of conscious experience still stands despite all the great advances in our neuroscientific and computational understanding of our brains and minds (Professor Daniel Dennett and Dr. Giulio Tononi not withstanding), I would like to posit a variant on the emerging "informational reality" ideas, one that integrates the ultimate subjective reality of consciousness. • My theory is this: what we know of as "physical reality" and "conscious reality" can be seen as the interaction between two "fields" or "forces", which fundamentally comprise the universe (and any multiverse of which it is a part of). One such field is "the information bearer", the computer that computes Reality, both conscious and physical, is the interaction between two fields or forces which fundamentally comprise the universe what we perceive as physical reality -- from the vastness of galaxies and stars all the way down to molecules, atoms and quarks. All known fields (and thus all particles of energy and matter that result in the "real world") ultimately break down to information; information is what the "knowable world" is made of. I propose an ontology that embraces this principle, through a "master field" that bears all the information of the phenomenal "physical" world. • The other master-field is what ultimately mediates our conscious experience. Somehow, the reality of our conscious being and our subjective experiences results from the interaction or intermittent "coupling" of these two fields. This coupling occurs in a fashion somewhat comparable to how the recently confirmed Higgs field imbues the behavioral quality of mass into certain quantum particles. Recall that every quantum particle, including electrons, quarks, bosons, etc., are themselves disturbances or "special conditions" witin a field. The Higgs field in effect couples (interacts) with the specific field from which electrons or quarks or W bosons arise, causing the "special conditions" area of the particle field (i.e., a quantum particle) to act in a manner consistent with that particle possessing mass (recall the thick syrup or crowded party anologies for the Higgs mechanism). • This "field of consciousness" is where the "feeling of being" or "ground state" or "essence of being" variously spoken of in this course (e.g. in Section 36) ultimately resides. These "pure" manifestations would in effect be the "basic particle", i.e. the "harmonic disburbance wave" of this field (using an anology used sometimes to describe the difference between quantum particles and virtual particles in quantum fields). • Perhaps the both of these "fields", the informational and the mental, can alternately be described as a "state space" or "phase space" of non-local character. They remain comparable in many ways to what we know as a "field", however, most likely akin to a "scalar field" like that behind the newly discovered Higgs particle. Again, recall Eccles' "psychon particles", which require a field (one paper actually suggests that the psychon might be the strange but scientifically ponderable "zero-energy tachyon", which like all elementary particles requires its own field, in this case a "tachyon field"). Also recall Libet's "mental field". So, for purposes of this course, I will continue to refer to the proposed informational reality, and the seperate reality behind conscious experience, as "fields" -- even though they are much more abstract in nature than the fields that we are most familiar with in everyday life, e.g. magnetism and gravity. • So yes, the Cartesian theater would be open for business once again -- but in another dimension (state-space, field) of ultimate reality. • Thus far, most physicists and cosmologists have not attempted to relate their ponderings about the ultimately abstract, informational nature of "physical reality" to the realm of consciousness (with perhaps the exception of cosmologist Max Tegmark, more below). Likewise, consciousness analysts have not yet made much effort to consider the physicists' dilemma as to whether "anything is real" other than information (with the notable exception of philosopher David Chalmers). I believe that there is a bridge here waiting to be crossed (Chalmers may already be half-way onto it, although I would take exception with his panpsychic conjecture, i.e. that that every system, including elementary quantum particles, has a degree of inherent consciousness). • This inter-field projection causes a reaction something akin to the scalar-field interaction between certain "normal" particles (such as the electron, neutrino and certain bosons) and the Higgs field, whereby the particles obtain the quality of mass from Higgs. The "consciousness field" thus appears to endow the temporary "special state" within the information field (akin to what cosmologist Max Tegmark recently termed "perceptronium") with the quality of consciousness. • The state of consciousness would be maintained as long as this small chunk of the information field remains in the special state. (The actual causal direction would probably not be from consciousness field to information field, however; the information field in this state would "act as if" conscious, but the experience of consciousness itself would occur within the consciousness field. The overall causal arrangement would probably be more akin to "type epiphenomenalism", with parallel mental and physical events and reactions occuring during any and all conscious experience; more on that below.) In this interaction with the consciousness field, our conscious experiences take place. When the "special state" dissipates, so does our consciousness. • Actually, some physicists and philosophers have propounded ideas that are not far from what is proposed here. I.e., David Chalmers (and to a lesser degree, Thomas Nagel) has contended something similar with his dual aspect or double aspect theories of information. Philosopher Donald Davidson's "anomalous monism" concept of consciousness could be seen as a precursor to what I propose here. Continuing research into the microworld of quantum mechanics (including its non-local nature) might also become relevant. Quantum physicist Henry Stapp has published interesting work on how consciousness may emerge via quantum "global" processes, i.e. wave-like processes influencing wide areas of the brain. • My overall paradigm here is roughly comparable to Popper's World 1 and World 2, with a field-particle interaction between the two "world-fields" (somewhat akin to how we view the quantum particle emerging as a reaction or “coupling” between interacting quantum fields). This concept is somewhat similar to what neurophysiologist John Eccles was developing with his psychon theories (which reflect a dualist-interactionalism approach), and which Benjamin Libet seems to ponder in developing his own "mental field" theory. My overall paradigm is roughly comparable to Karl Popper's World 1 and World 2 It may also occupy common ground with early speculation that the theoretical holonomic nature of brain processes allows consciousness to possess an irreducible and indivisible nature, and to hold deep connections with "implicate" relationships and structures underlying the various processes by which we now know and analyze physical reality (e.g., time, space, gravity, quantum particles and fields, information, etc.). My proposed "world-field interaction" would mostly be a matter of the "physical/informational wor ld" (World 1) projecting into the mental world (World 2), and not because of any direct effects upon the physical / informational world provoked from the mental field. I.e., like a one-way street. • In a sense, then, the epi-phenomenonal / non-causal paradigm of consciousness would be the best way to view consciousness after all -- but in the sense of "type epiphenomenalism", where mental experience can have parallel physical and mental aspects. The physical aspect, but not the mental aspect, is "causal"; i.e., the physical side can cause future effects on the physical world, but the mental aspect cannot. • Note that despite on-going neuroscientific research which as severely limited the role of "consciousness" in human volition, the physical processes which amount to "neural correlates" of mental experience still appear to have important functions and effects upon the physical workings of the brain. The recent "Passive Frame Theory" postulates that "consciousness" (in the "easy problem" sense) may not itself direct decision-making, but provides a "central hub", an integrative process or platform by which decisions can be made from miriad sub-conscious processes (somewhat akin to Baar's "Theater"/Global Workspace theory, but with certain differences such as being more "componentized" and less continuously interactional in nature). So, it indeed appears that the "parallel processes" of conscious experience influence the human being and the world that she or he exist in; but these processes do not and cannot explain the true essence of the parallel conscious experience. Thus the need for a "hybrid epiphenomenal" view, such as type-epiphenomenalism. • The informational field driving what we know of as the physical world (World 1) seemingly has some sort of awareness or "pre-programmed information" regarding the World 2 of consciousness; it seems to "know" (or is programmed to know) that a certain highly integrated and concentrated state of information will cause a disturbance in the scalar-like, Higgs-like field of the conscious mental world (the World 2 field). • In that sense, consciousness has causual effects within the informational realm (and thus the physical world that we know), just as though consciousness "as a whole" IS more than epi-phenomenal. This would be allowed under the "type epiphenomenalism" viewpoint. Another way to view this is that "joy is universal", and so is pain. The information field sometimes determines behavior in the instance of a human body and human brain that is consistent with the feeling of emotions; and in those cases, a corresponding interaction with the consciousness field triggers the actual "feeling" of that emotion and of the body's response (which Dr. Antonio Damasio considers key to the experiencing of emotions). Arguably, the emotions are "universal" even to the two fundamental "world-fields". • Once again, an awareness is programmed within the physical/informational World 1, such that it can obtain "special states" that trigger a consciousness reaction in mental World 2. This resultant “knowing about conscious feeling” within World 1 might arguably enhance the survival of beings (virtual beings, of course) that obtain the ability to project into mental World 2. How? Through enhanced inspiration to survive (i.e., acting behaviorally as if having consciousness is generally more fun than not having it); perhaps thus having a natural selection effect favoring consciousness. • This “sub-conscious” knowledge (information state) on the part of the virtual World 1 entity, i.e. that it is conscious in World 2, would enhance its necessary will to live (recall the importance of "will" in Schopenhauer's philosophy). That "will" may otherwise have been compromised as the evolutionary process (once again, a virtual evolutionary process) replaced hard-wired instincts for survival with more flexible environmental analysis. (William James commented on the "imperative of survival" inherent to consciousness). The subconscious awareness (again, an information state) that a “joy-of-being” response is happening in World 2 arguably works to counter the “to be or not to be” ambiguity that a flexible brain can develop -- i.e., the possibility that rational thought can lead to suicide, something that only human beings can do. I believe that this will-to-live and joy-of-being is directly related (and perhaps identical) to the "feeling of being" experienced most vividly in deep meditation (see Section 36), but generally present in the mental backdrop, as discussed above. • World 2 would have a limited role, relative to human expectations regarding "the transcendent". We have no evidence that the projection into mental World 2 from the information-computing World 1 is permanent in nature; it does not appear to amount to an "eternal soul". We World 1 creatures have no “bank account” in the mental dimension, no long-term memory or records accumulating there. When we are in deep sleep, or under anesthesia, or dead, there is no reason at present to believe that the mental World 2 would somehow "remember" us. When the "field coupling" conditions in World 1 end, the conscious reaction in the World 2 field would also end. • In a way, World 1 (the virtual reality world created by an information field) would be akin to Mary, the colorblind neuroscientist (going back once again to Frank Jackson's "Mary's Room," thought experiment, see Section 9). As with Mary, the World 1 "field" and its computing processes would know everything there is to know about how physical reality (however virtual in nature) processes information so as to cause mental dynamics (which satisfy Tononi's "Phi" measure, as discussed in Section 35), and the behavioral responses that correlate with conscious experience and emotional feeling. (Both Mary and World 1 know the physical response to "qualia" at all levels, from the swirling electrons in neurons, through the contracting or loosening of muscles and blood vessles, right up thru the poetry or loveletters or hatemail that a person might write in response to a particular experience.) World 2 would be the realm where Mary's actual experience and feelings would take place as she leaves her black and white room and sees a red rose. • The World 1 - World 2 interaction is thus quite complex, as the above anology would indicate, given World 1's pre-existing knowledge of World 2 and its ability to endow its "automata" (virtual beings) with physical reactions that are in synch with the The World 1 field "understands" qualia and the experience of qualia ... even though it doesn't experience qualia itself experiences taking place in World 2 (which are continuously projected from World 1). Back to the Mary comparison, the World 1 field would know just how Mary should react (again, on all levels) once she finally gained the knowledge of conscious experience. And it would thus cause her to react in that way . . . even though it never "experiences" what goes on in World 2. It completely understands the "experiencing of qualia" . . . even though it never actually experiences qualia. Its understanding is in terms of information. The World 2 "experience" is something other than information. This model is not inconsistent with Damasio's view that mental emotional responses, i.e. conscious feelings, are more of a reaction than a precursor to the body's response to provocative stimuli. • World 1 without World 2 would thus produce the equivalent of the hypothetical "philosophical zombie" as discussed by Chalmers and others (mentioned in Section 6). The "P-zombie" is a creature that would react just as any normal human would when poked with a hot fork, or complemented or insulted, or told she or he was loved or hated . . . but ultimately, the P-zombie would not consciously experience the feeling or emotion associated with such a stimulus and response. From the perspective of Jackson's thought experiment, Mary gains something by leaving her room to experience an actual red rose; but World 1 does NOT. World 1 is one really smart field, in terms of information. • Obviously, my theory here (which is really a grand speculation, a bit of an elaborate thought experiment, a "what if") requires that conscious experience, i.e. that which happens in World 2, is NOT reducible to information. Nor does information reduce to consciousness. Information and conscious sentience are fundamentally different stuff, the two fundamental "substances" that interact so as to produce the world that we know. • I further propose that our brains, as virtual instantiations (aka "automata") within the World 1 "virtual reality program", learned through the natural selection process (which is also a "virtual reality instantiation") a certain complex physical "trick" that is embedded and known within in the overall World 1 information field, a trick that triggers consciousness in the World 2 mental field. This "trick" is a threshold event or state change that causes the field interaction or field "coupling" between World 1 and World 2 to occur for a particular "automata". Remember, once again, that our brains and their learning process, along with evolution and natural selection, are themselves not happening in a solid physical medium as we imagine in everyday life, but are taking place due to computations within an ethereal information field, akin to how one of our "real" computers can simulate a digital reality through appropriate programs and inputs (recall "The Matrix" movie, once again). • This "awareness of our being", our self-consciousness, happens in such a way that we do not become intellectually aware of its boundaries and limits, such as we are aware of empirically verifiable things like "The Beatles" or plastic garbage cans, or photons and neutrinos. It is even more abstract than "love" or "truth"; it is like deep-sea fish trying to become aware of the ocean waters where they live (some of these imaginary fish near the surface can occasionally jump into the air; they may then report hints of a "new realm" different from the water-world they otherwise take for granted – again, in the "story book" sense of this analogy). • In another way, though, the World 2 "mental field" is MUCH more important than the information and processing abilities of World 1. As such, if a virtual tree falls in a World 1 forest and is never in any way projected into conscious awareness within World 2, it is quite irrelevant. (Arguably, however, some tiny trace of this and every other quotidian event will eventually influence a "conscious automata", and thus eventually does find some expression in mental World 2). In a "real" sense, then, the determinism of the information and informational computations going on within World 1 only "exist" because they somehow cause reactions within the mental/conscious realm of World 2! • In sum, just because reality turns out to be more ephemeral than what we expected, more like a computer simulation than the "real, hard stuff" that we perceive in our daily lives, does NOT mean that this reality is a fixed, dead, ultimately unchanging thing akin to the "block universe" or "eternal recurrence" that philosophers once pondered. Computer simulations, even as we know them in our own familiar "tangible" computers, can be truly interactive, unique, contingent and creative. Chaos and complexity theories have shown that interactive systems can produce unique and unpredictable effects despite every processing step being deterministic (a "master reality simulation" such as World 1 must be extremely interactive amidst its objects / automata). Quantum randomness introduces another layer of creative potential. • So, consciousness as expressed into, and finally experienced within mental World 2, is somewhat epi-phenomenal (i.e. does not have a direct casual impact) relative to World 1 computing. It would not violate the physical laws known to us via World 1, specifically the problems of energy conservation (i.e., where would "mental energy" come from and where would its waste heat / entropy increase go); and the troublesome requirement that World 2 be manifested in terms of spatial location if it is to cause physical change to the brain's neuronal activity. • However, the World 1 "program" obviously DOES know something about the existence of mental World 2, and how to interact with it so as to project conscious-experiential reactions within that realm. Consciousness thus DOES affect World 1; it is not entirely "epi-phenomenal" (recall the discussion above regarding "type epiphenomenalism"). The World 1 virtual-reality program obviously DOES know something about the existence of mental world 2, and what creates conscious experience within that world-field. But it is more a matter of an "object" or "automata" in World 1's programming (i.e., a human being) DISCOVERING what the overall World 1 universal program knows (via the bio-evolution process/DNA information, interacting with the body of human social knowledge). Sidenote, I am thinking here of “objects” and automata in the sense of modern object-oriented computer programming, or perhaps a more complex form of "cellular automaton". In a sense, consciousness from the World 1 perspective is the equivalent of Chalmers' "easy problem consciousness", including its neural correlates and environmental context; and the World 2 interaction/reaction represents his "hard problem consciousness". • We self-conscious creatures are thus different from all of the other "running objects" or automata within the master computer program that is World 1. Because the "computational objects" (as in object oriented programming) of which we are comprised gain knowledge of World 2 from World 1’s overall “library”, they/we behave fundamentally differently from every other "object" running within the World 1 "matrix", e.g. hydrogen gas, asteroids, bacteria, etc. These objects do not know about World 2. Dogs have stumbled across a hint or two, while dolphins, whales and higher apes contain a limited "World 2" capacity. For humans, though, our complex sense of self and the knowledge that we are experiencing feelings (in another dimension, of course, that being mental World 2) give us, as "semi-independent information processing objects / automata", what we know of as "free will". I.e., some measure of irreducibility and ontological significance. • The questions regarding such a concept abound. Do we actually relate to other people around us who are likewise independent and “real”, or are they just an artifact of a dream that we are having? Arguably, other people ARE just as real as we are, if we believe that World 1 is "objective", i.e. that it substantially The questions from the idea of a virtual-reality World 1 interacting with a World 2 of conscious experience abound exists (however differently and abstractly from what we expect from our daily-life experience of hard, real things and external forces). But it cannot be entirely disproven that "this is all just a dream", i.e. that we are the only decision-making conscious object in the World 1 computed universe, that we are basically Boltzmann Brains (as discussed in Section 39); and that all other humans (or otherwise conscious beings that enter our awareness) are totally pre-determined within our master-program, akin to puppets put on the stage of a perceived reality for our entertainment. • Another interesting question that begs to be asked is, just what is the reality behind World 1 and World 2? We could not know if there is such a "master reality", although we have a hint from the undeniable ability of World 1 to know about and relate to World 2. It would seem a long stretch to posit that the ability of informational / computational World 1 to carry out complex interactions that cause a reaction in World 2 just happens by accident. But as to what that ultimate "grand union" relationship might be, what sort of Taoist "yin / yang" might unify the informational / computational and the mental / conscious realms, is beyond this already very tenuous proposition regarding what our consciousness is and why it ultimately perceives (through science and reason) such a strange and insubstantial cosmos around it. • Is the "World 1" information field infinite or finite in nature? Does it have length, width and height, or are those measures irrelevant to it? Is it subject to time, or is all time contained within it? Is it closer in nature to being digital or analog? If it is finite (or to the degree that it is finite), is it static or dynamic? Does it build up new information? If infinite, is it subject to "eternal return" -- i.e., everything that can happen does happen and happens an infinite number of times. I.e., does the World 1 information field reflect an ontology based on "Groundhog Day"? Or is there room somehow for novelty? • These questions reside at the far edge of metaphysical speculation. I would like to move back for a moment to the implications of my theory for our "known world". If our earthly reality is ultimately a set of interactive computer programs processing information (and recall that a computer program itself is just information), we should still ask: what is it about the healthy, living human brain in a state of sufficient activation that sets off a scalar-like interaction (i.e., akin to how the Higgs field endows certain particles like electrons with the quality of mass) with the World 2 "consciousness field"? I believe a necessary (but not sufficient) gateway condition for this state is described by the "Information Integration Theory of Consciousness" from neuroscientist Giulio Tononi, as discussed in Section 35. But in addition to "integration", this information state requires distality, density, an appropriate input rate and processing speed relative to the surrounding environment, a "time-echo" from short-term memory that helps to avoid the chaos of an on-going series of quirky "consciousness flashes", and comprehensiveness regarding the universe that World 1 reveals to us. • However, I disagree with Tononi's assertion that any "Phi" within an entity (discussed in Section 35), i.e. any information integration in a system's interactive functioning, endows that entity with some level of consciousness (whether the system is an organic living being or not). Likewise, I disagree with David Chalmers' notion that every interactive system in the universe, whether a human being or a quark, has some degree of consciousness. I believe that there is a threshold to being conscious, i.e. to being able to interact with the World 2 field. Perhaps the phrase "systemic awareness" better encompasses what the Phi / Integrated Information concept captures, as opposed to "sentient consciousness" (i.e., consciousness in the "hard problem" sense). • Consciousness has a threshold, and is not "a part of everything": Physical systems as we presently know them are full of examples of discontinuous natures, of tipping points where an otherwise-stable quality begins or ends. For example, molecules in a substance interact with heat energy (temperature) such that they experience "phase transitions" at some point, e.g. water turning to ice, or dry ice into gas. Consciousness has a threshold, and is not a "part of everything", contra to panpsychism Also, in the world of particle physics, the concept of "symmetry breaking" explains how the basic particles and fields would all be unified at a very high energy level (as in the Big Bang), but as energy levels drop, field interactions cause discontinuities such that a generic field / particle system splits into different manifestations; for example, at normal energy levels, the unified electro-weak field is split by the newly-discovered Higgs field into the familiar photon of light and magnetism, and into massive but very short-lived "W" and "Z" bosons (responsible for certain nuclear reactions such as radioactive decay). • Thus, I reject the "panpsychic" notion of continual consciousness, and posit a field-based dualism -- i.e., a World 1 information field interacting with a World 2 field where conscious experience is instantiated under "special conditions". These conditions / interactions are relatively rare within the overall Universe and require a complex set of "tipping point" conditions to occur within that Universe. Although rare, we know that these conditions occur within the healthy living human brain here on planet Earth -- i.e., consciousness is caused by some particular condition within the World 1 field, while it otherwise provides for the virtual reality behind that brain, that Earth, and the whole physical Universe around it. • In sum, World 2, the realm where conscious experience takes place, is not a tangible place within or outside the known universe; it is not a ghost or soul drifting in space and time. Ironically, though, NEITHER ARE space and time Everything we know in our daily lives can be reduced to information . . . EXCEPT for consciousness! (and matter and energy) what they seem to be in our everyday life; they are ultimately virtual creations of the informational WORLD 1!! I.e., there IS NO "tangible universe", i.e. no ultimate reality based around hard objects and irresistible forces moving in empty space according to a constant (or relativistic) drumbeat of time. Reality then has two irreducible components: information, and conscious experience (of the "hard problem" variety). Everything we know in our daily lives can be reduced to information . . . EXCEPT for consciousness!! • Just how explanatory is this dualistic "World 1 and 2 field theory"? Is it just "kicking the can down the road" regarding the nature of consciousness, finding a "make-believe place" to put the Cartesian theater? The World 2 field would certainly be quite different in "output" than the familiar results of World 1 virtual processing. World 1 sets up the rules and informational structure for "moving stuff around" in virtual space; i.e. photons, electrons, quarks, gluons, along with their higher level manifestations as atoms, molecules, gravity, metals, crystals, light, magnetism, radioactive phenomenon, living beings, etc. The World 2 field somehow creates a "spectator", a "conscious observer" for the big quantum morality play that World 1 puts on. • What are the actual mechanisms by which World 1 "weaves" an emergent observer in World 2 from its information flows? How does World 2's mental field allow that information to form and "in-form" a burst of conscious experience (even if only for limited periods of time for each individual instance of consciousness)? Admittedly, What are the actual mechanisms ? All we ultimately know is that SOMEHOW, it DOES HAPPEN I know of no way to get beyond these questions. Aside from the hints provided by Tononi’s Phi concept (discussed in Section 35) and Damasio’s notions of the distality and comprehensiveness of information states in conscious beings (discussed in Section 34), along with continuous interaction with the surrounding environment and a smoothing time-echo from short-term memory (discussed in Section 27), all we know is that SOMEHOW, it DOES HAPPEN. This is the simple, irreducible fact that Descarte wished to discuss. Despite the dead-end, I still feel this approach takes humankind further than what Dr. Dennett and his like urge on us: i.e., that contra Descartes, the conscious experience of "I AM"-NESS is a False Idea. • Obviously, in certain World 1 "instantiations" (i.e., in some human lives), these influences are drowned out by chronic environmental conditions; e.g. cruelty and criminality reign. But even criminals have occasional if short-lived twinges of noble sentiment. Perhaps World 2 mental experience is attenuated to some degree by the neural processes and pathologies underlying depression (corresponding to the general lack of “feeling” during depression, the diminishment of qualia), thus allowing suicidal notions to fester in those who otherwise experience productive lives. Humans seem to be unique among animals in their ability to voluntarily end their lives because of mental conditions - perhaps owing to World 2's indirect influence (i.e., World 1 being pre-programmed to know about World 2), or more precisely, the occasional occlusion of such influence. • Could a substance-interaction dualism / “virtual reality” theory ever be tested and proven? It would be extremely difficult, because the idea is so large and so difficult to break into practically testable components. Eccles was reported to be pessimistic that his psychon theory could ever be empirically verified. It's hard to find a relevant starting point, as compared with typical scientific challenges. However, this quandary currently applies to all of the other candidate theories that would explain the ontology of consciousness. The best hope, in my opinion, is a long-term one, based upon an approach that would "grasp the problem as a whole". Perhaps someday, far in the future, a real "Neo" will somehow uncover the World 2 mental field ! • My World 1 / World 2 interaction paradigm of consciousness does not require a God, nor a conscious life after death. It does not convey or confirm any 'extra-physical' powers available to certain minds, such as ESP, astral traveling, bending spoons, spirit projection, or any other hokey “psychism”. The vast knowledge, power and authority of science and all of its research and theories are in no way diminished by my viewpoint. • However, at the same time this paradigm does not preclude an afterlife or a "master conscious entity" (divine power) behind it all. As consciousness functionalists contend (along with Star Trek fans thinking of the 23rd Century teletransporter), if the physical-computational reality (World 1) actually does preserve all information within it, then it is theoretically possible to re-create a conscious life within a new and assumedly My interactional dualism does not require, nor preclude, an afterlife or a divine power behind it all more expansive interaction between programmed information and conscious reaction. Cosmologist Frank Tipler considers the question of whether a recreation ("resurrection") of the dead via an information-based re-creation mechanism is possible, in his book The Physics of Immortality. Although Tipler uses a now-rejected cosmology, i.e. the "big crunch", to power an eventual virtual resurrection of the dead, his considerations of what a “virtual afterlife” might involve are quite interesting. They are actually not all that far removed from the "Singularity" concepts made famous by cyber-futurist Ray Kurzweil. • In sum, I believe that substance-interactionist models based upon a field-based virtual reality viewpoint with dualist groundings can be intelligently developed. Such views are not immediately precluded by current scientific knowledge. I believe these models would make useful contributions to the ongoing debate regarding the ultimate nature of human consciousness. I find it regrettable that dualist thinking is instinctively rejected by most academic and scientific institutions, for reasons that ultimately conflict with their credo of open-mindedness (i.e., the fear that religionists might cite any dualist leanings as to support their own dogmas). • I have declared my own viewpoint towards consciousness to be dualistic in nature, for it posits ontological mechanisms beyond those currently known and accepted by modern science (however inspired by what science presently knows regarding quantum field interactions). Because I am not an academian, I possess the luxury of open thinking; I need not fear the politics of funding and career appointments. Thus, I feel no qualms about turning the standard ontological assumptions of most scientists concerned with consciousness on their head. I.e., instead of assuming the physical world to be the ultimate grounding of reality, with consciousness emerging as a particular reactional dynamic within that reality, I propose that both consciousness and the physical world are "emergent phenomenon" of two parallel realities, realities which in their interaction provide both a consciousness (however fleeting), and a universe to be conscious of. • Despite the dualist grounds of this viewpoint, my beliefs reflect an ultimate acceptance of monism. I don't believe in a universe of multiple realities that are forever mutually exclusive, forces that randomly intertwine to create the world that we know. I acknowledge that many dualistic explanations of natural phenomenon were eventually replaced by scientific concepts, e.g. caloric fluid being replaced by molecular thermodynamics, phlogiston replaced by oxidation and combustion, the aether superseded by quantum photons, and vitalism being sidelined by blood and DNA. • I suspect that both consciousness and the physical/informational world described by science ultimately reduce to some unified, monistic metaphysic. Attempts to define consciousness in the physicalist and reductionist terms of today's science are like trying to describe steam in terms of ice crystals Both the World 1 and World 2 realities represent manifestations of a still-unknown core reality, just as ice and steam are manifestations of water, and just as light and magnetism are manifestations of electromagnetic energy. I disagree with those who believe that conscious experience can be reduced to (or exclusively correlated with) what is currently known of the physical world through science. That would be like trying to describe steam in terms of ice crystals. • I have termed my approach to the problem of consciousness an "interactional dualism" for good reason. In our daily lives, we do not experience consciousness and everything else seperately. Consciousness "just is" our overall experience of ourselves and everything else. I have posited two ontological "substances", i.e. 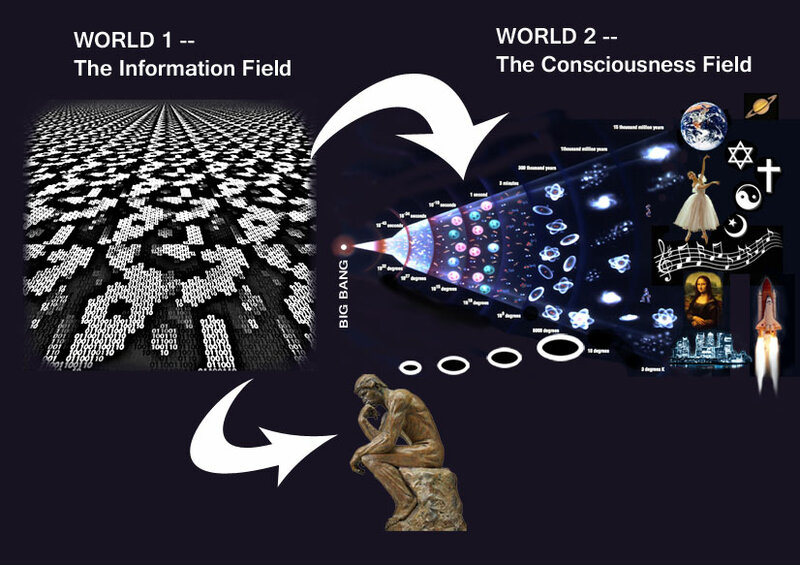 information (World 1) and consciousness (World 2). But I have tried to avoid saying that "the physical world Interaction is the thing. In the interaction, we see hints regarding the importance of an ultimate monism lives strictly in World 1, while conscious experience stays put in World 2". The more you might ponder this, the blurrier the line between the two "Worlds" becomes. For example, our Big-Bang Universe is fully specified by the information in the World 1 field; but our conscious experience of it occurs because of a ripple in the World 2 consciousness field. So where does our Universe reside? It is the INTERACTION that truly makes things exist for us. The interaction is the thing. A dualism is involved in the lead-up to this interaction; it takes two to tango. But in the interaction between the dualistic realities, we see hints of the importance of an ultimate monism. • At present, our science is not big enough to fully encompass the subjective mental experience of consciousness. Some thinkers (i.e. "mysterians" such as philosopher Colin McGinn) doubt that it ever will be. I am unsure about that, given the new ponderings among physicists regarding the informational nature of ultimate reality; but I am convinced that despite the accelerating progress of science over the past century, consciousness is still a long way from its grasp. So, the "dual" in my version of dualism is mostly an acknowledgment of the unknown. • My "interactional field dualism" is more of an epistemic dualism than an ontological dualism. (Philosopher and sociologist Jurgen Habermas held a position balancing epistemic dualism and ontological monism.) Admittedly, the virtual interactionist paradigm that I discuss is no more than an educated guess on what the greater truth might be. • In the end, my "interactional field dualism" assumes an ultimate monism, and thus is not terribly far from non-reductive physicalism, and at a slightly greater distance, from property dualism and philosopher Donald Davidson's anomalous physical monism. However, I disagree with the stringent "token epi-phenomenalist" implications of the Chalmers approach (Davidson's theory is more sympathetic to the "type epiphenomenal" approach that I assume). Our bodies and minds live in the 'virtual fields' of World 1 information, while our sentient conscious experience lives as a rippling pattern on the World 2 field (and yet, World 1 always knows the perfect physical reaction to World 2 experience). And yet, these fields must somehow "couple" and interact; they both know all the steps in the cosmic dance. In the end, IT IS ALL BUT ONE WORLD !! •	CAVEAT: About 10 years ago, I became interested in human consciousness, and have read a fair number of books and articles about it. I have also formulated some thoughts of my own. I've decided to write up a web page on Consciousness, digesting what I've read and intermixing some of my own conjectures. Let me admit that some of this will represent my own guesswork. I'm not a formal academic, just an informed layperson. As neuroscientists discover more about the workings of the brain, much of what I say here will probably change, and some if not all of my own conjectures will be proved wrong. But it still represents an interesting learning process for me. •	UPDATE, NOVEMBER 2014: When I first posted this "course" about 8 years ago, there were not as many web-based resources available on the topic of consciousness. Since then, a wide variety of consciousness sites that are academically oriented or otherwise quite serious and thoughtful have either come on-line or have been enhanced. I wondered at first whether my site, which had become a bit "dusty" and incomplete, was even needed any more. But I started catching up on what has been written and discussed about consciousness over the past five years, including Tononi's Phi concept and Tegmark's notion of "perceptronium", and the bug bit me once again. Despite the increasing mathematical sophistication of the discussion, the mystery of consciousness is still NOT solved, and much remains to be said about it. So I decided to get back into the fray and knuckled down to some heavy-duty research and reading. Nonetheless, I need to point out here, for anyone not familiar with all the wonderful resources on the topic, some of my own favorite sites on the subject: Peter Hankins' Conscious Entities site and on-going blog; the Scholarpedia overview of consciousness models; articles in the International Encyclopedia of Philosophy and Stanford Encyclopedia of Philosophy; the Dictionary of Philosophy of Mind; the "Philosophy of Consciousness" tutorial on Google; and sites put up by scholars such as the redoubtable David Chalmers; and too many others here to list. •	Despite all that is available on the topic, I hope that some portion of my thoughts might be of help to someone else interested in the subject, might spur some further thoughts on a very interesting subject! For this is one area of science where the laboratory is within ALL OF US. Consciousness is a fascinating but elusive phenomenon; it is impossible to specify what it is, what it does, or why it evolved. Nothing worth reading has been written about it.